Macedonian, the official language of the Republic of Macedonia, is spoken by two and a half million people in the Balkans, North America, Australia, and other émigré communities around the world. Christina E. Kramer’s award-winning textbook provides a basic introduction to the language. Students will learn to speak, read, write, and understand Macedonian while discussing family, work, recreation, music, food, health, housing, travel, and other topics. 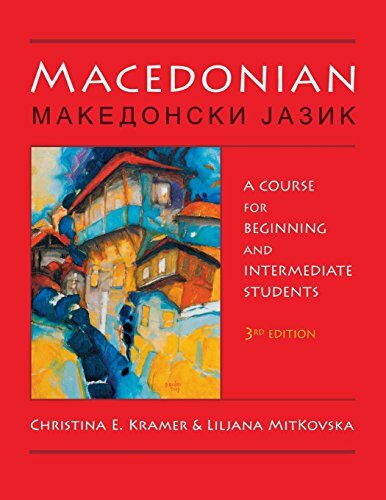 Intended to cover one year of intensive study, this third edition updates the vocabulary, adds material to help students appreciate the underlying structure of the language, and offers a wide variety of new, proficiency-based readings and exercises to boost knowledge of Macedonian history, culture, literature, folklore, and traditions. Christina E. Kramer is professor of Slavic and Balkan linguistics at the University of Toronto. Liljana Mitkovska is associate professor of English grammar and English-Macedonian contrastive analysis at the FON University, Macedonia.